Indian Renewable Energy Development Agency Limited (IREDA) will organize Assistant Manager exam on 25 September 2016. The test is to be held as a part of this recruitment's selection process. Now IREDA Assistant Manager Exam Admit card are available for download. You can get them from below given link. 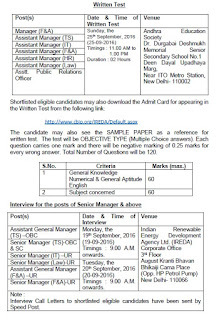 Indian Renewable Energy Development Agency Limited is going to conduct written exam on 25 September 2016 for Assistant Manager posts. For that, admit cards can be downloaded now by following the link below. The test is to be held for following posts. The test will be held on Sunday, the 25th September, 2016 (25-09-2016) Timings : 11.00 AM to 1.00 PM. The duration of the test will be 02 Hours. Follow the link below to download IREDA Assistant Manager admit cards from here. The written examination consists of 120 multiple choice objective type carrying 120 marks. The candidates can download their admit card from IREDA website from here. In order to download the admit card for IREDA Assistant Manager exam, visit the above link and enter the required details i.e. email id and registered mobile no. 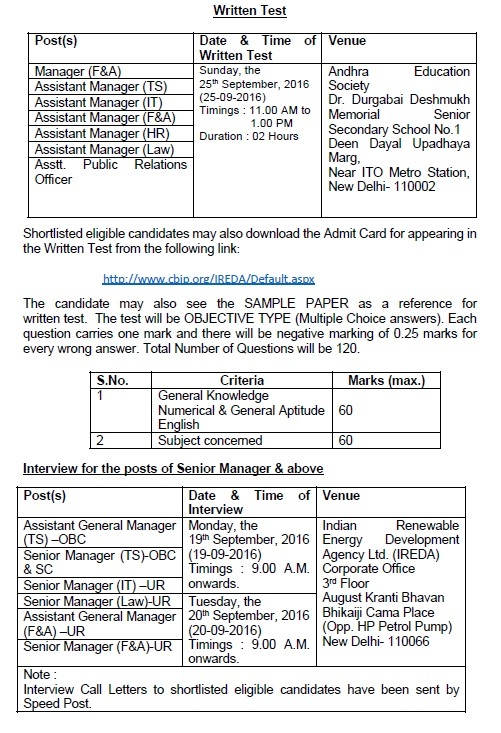 Their IREDA Assistant Manager Admit card 2016 will be displayed on the screen.